New Delhi:3/118/18: Mahanadi Coalfields Limited (MCL), has received Central Vigilance Commission’s Vigilance Excellence Award-2018 for ‘Excellent Contribution’ in the category of ‘Best Institutional Practice for Fighting Corruption’. 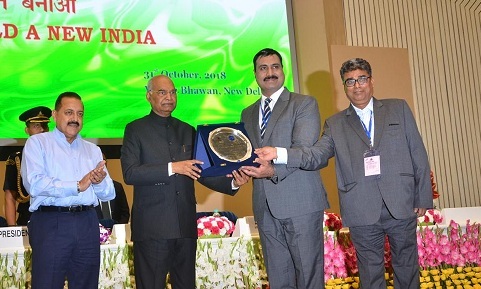 MCL’s Director (Finance) Shri K R Vasudevan and Chief Vigilance Officer Shri Munawar Khursheed, IRPF, received this prestigious award from Shri Ram Nath Kovind, the President of India, at a function in Vigyan Bhawan on 3rd November at New Delhi. Officers and staff shared the joy of winning this national award and witnessed the award ceremony, which was telecasted live by the national broadcaster. MCL, a leading coal producing company in the country, has also been the pioneer in introducing Information Technology-based initiatives, like 3DTLS, Geo-fencing of coalfields, GPS-based vehicle monitoring, etc. to set highest standards of transparency in business operations. Previous: winter session of Odisha Assembly will commence from November 16.